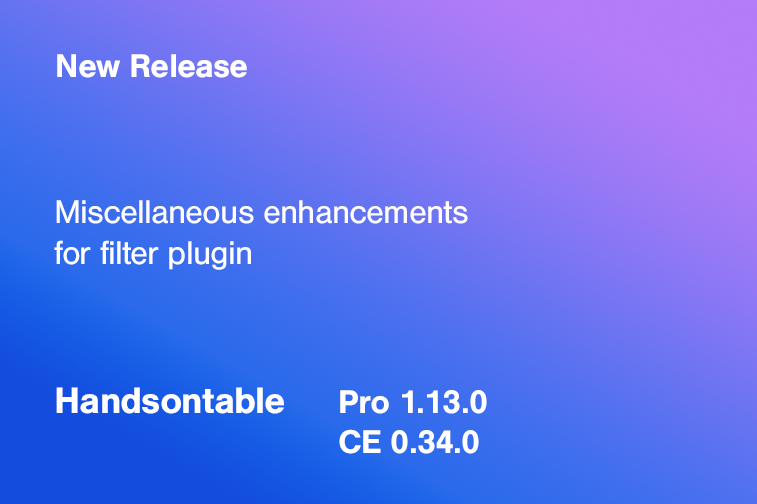 Today we are happy to announce that Handsontable Pro 1.13.0 (Community Edition 0.34.0) is finally out the door. In this version we have fixed a few minor issues that were reported by our community on GitHub. Also, new enhancements to the Filter plugin are introduced. Most of them are connected with the new capability to set AND/OR conditions through the visual part of the plugin as well as its API. We’ve unified the types of coordinates passed to these plugin hooks: beforeGetCellMeta, afterGetCellMeta, afterSetCellMeta. Now they’ll be operating on visual table coordinates (so do the getCellMeta and setCellMeta methods). Please make sure you update your hook callbacks to use them properly ( #4409). Fixed a problem where the Filters plugin threw an error when there was a condition with too many arguments applied. Added support for the EXP formula in the Filters plugin. Changed the text in the warning message thrown when the amount of conditions exceeded the capacity of the dropdownMenu. Fixed the alignment of the checkboxes in the Filters dropdown menu. Fixed a problem where the Filters plugin threw an error when adding a condition with an improper name. Fixed a problem where the Filters plugin threw an error when using the disablePlugin method while the Dropdown Menu plugin was not enabled.